Hey there. 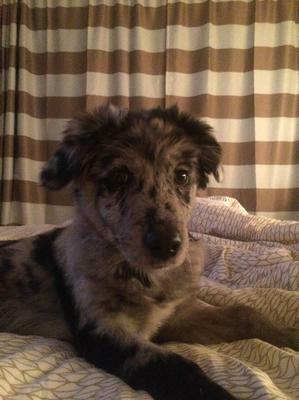 I rescued my sweet female Australian Shepherd, Annie, a little over 3 months ago (as of right now she is 5 1/2 months old) and I have noticed her being more aggressive towards me. She has been biting (not nipping) and actually breaking the skin. She also starts getting this stare in her eyes that is very unsettling. The other day, I was doing research on my computer and she was in the room with me laying down. All of a sudden, she put her paws up on the chair arms and lunged toward my face, trying to bite me. She went through 5 weeks of obedience training with me and it ended a little over 3 weeks ago. Whenever she gets in this mood, I become firm with her and tell her no then put her in her crate for 'time-out' but it doesn't seem to work. I love her to pieces and will not give her away but I honestly do not know what to do. Any help/advice will be appreciated! Aww! She's adorable!! I have 2 Jack Russells and an Aussie. Jacks are known for their high energy and so are Aussies but I can tell you that my Aussie has double the energy that they do put together. Does she get a lot of various kinds of exercise? They are VERY smart dogs so they need a lot of mental stimulation as well as physical. What you said about her sudden jumping on your arm while you were on the computer... my Aussie doesn't do that but one of my Jacks does. Basically when she knows I'm doing something else and not paying attention her. Lol. Good luck! They are a lot of work but very much worth it! Get professional help. Biting and that scary look she gets is not playing. That is unacceptable behavior. Make her know you are alpha dog before she gets bigger and can do serious damage. These are highly intelligent dogs, learn fast but also need serious disipline because if this. I wouldn't use the crate as a punishment or it will become a place she relates to for being bad. When you disipline her you want to see her roll on her back and show you her belly for submissive behavior. She may just need much more activity and is trying to tell you she needs a job. We actually got a second dog of her own age to help keep her busy. They would play for hours. My dog showed some aggression with certain triggers like a raw bone or a raw hide chewy. But it was taken away from her, never to return. That behavior stopped when trigger removed. Please, get help before she does damage to you or someone else. What worked for our puppy was to let her know who was boss. If she did something beyond the pale that wasn't acceptable we'd grab the scruff of her neck, growl and give her a bit of a shake (nothing too violent) - just like her mum would. We made sure we went through doors first, only let her up on the couch when we gave her permission, set up a time out which was NOT her sleeping place but an isolated part of the house - back corridor - with nothing interesting and that was dark when all the doors were closed. (very isolating), played when we said, put out food but only let her eat on command, etc. If you don't become the boss, the Aussie will. We also worked out that she had biting tendencies - some just are - so we would play and if she bit even a quarter as hard as would cause injury we yelped like a hurt puppy and she soon learned what was enough. Two years on, we play fight often including biting and we haven't had a yelp in ages. Hope this helps. My 10 month old mini Aussie gets bored if I am not doing something she wants me to do. She gets up on my lap and stares at me, she gets mad a tries to bite my heals or back of my leg. Our puppy trainer told us to put her on time out in her Kennel it works. We tell her if she keeps it up she will go to the kennel. Calms right down. We also use a spray water bottle to help control bad behavior. She is coming right along. They are a lot of work. They do calm down some. But needs lots of attention and love. Hope this helps. Be firm for some reason they love you more when you show them who is the boss. Love my baby Dollie she is a Red merel. Thank you all so much for your insight and help. Char, I was curious when you said spray water bottle? Do you put water in it and spray Dollie with it when she is acting bad? Lol I know I probably sound a bit dumb!